As of January 1, 2010, under the U.S. Environmental Protection Agency’s (EPA) Mandatory Reporting of Greenhouse Gases Rule, the United States has required thousands of companies within its borders to monitor and report their greenhouse gas emissions. The Trump Administration has sought to weaken past EPA regulations, such as the Mercury and Air Toxic Standards (MATS) that was implemented to limit mercury emission from coal plants, citing that costs outweighed benefits. There are a wide range of strategies that have been developed in order to mitigate emissions and to promote certain sustainable objectives such as energy security, pollution reduction, and sustainable economic development. Energy Star, created by the EPA and Department of Energy in 1992, has become a standard for energy efficient consumer products that has been adopted by countries around the world. Other government programs that have been enacted often target heavy-emitting industries such as agriculture , forestry, and waste management. The United States has also developed polices and measures on state- and regional-levels and also include private sector initiatives to encourage the reduction of emissions. 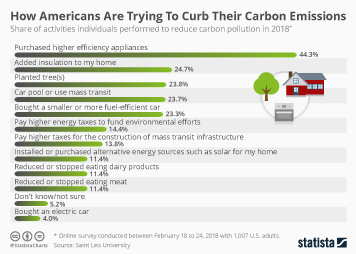 After reported 2015 to 2017 carbon dioxide emission declines, largely due to a reduction on the reliance of coal-fueled energy, greenhouse gas emissions in 2018 rose sharply once again. The increase in 2018 was one of the largest gains in the last two decades. One of the biggest contributors of GHG emissions arises from major energy providers. A major shift towards natural gas and renewable sources has contributed to the decrease in emissions. However, the increased extraction and consumption of natural gas has also increased the sector's emissions. Historically, GHG emissions tended to reflect economic fluctuations, as seen in the growth of the power, transportation, construction, and industry sectors in the United States in 2018. More interesting topics from the industry "Emissions"